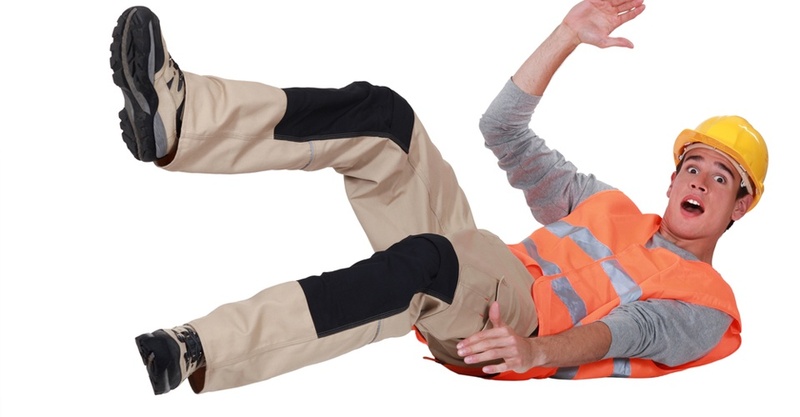 Often cited on OSHA’s top ten lists of workplace injury incidents, a slip, trip, or fall accident is, unfortunately, a common jobsite occurrence. Today’s post takes a quick look at some things you can do right now to help everyone stay on their feet and on the job. A slip, a trip, or a fall? A slip occurs when there is too little traction between a person’s shoe and the surface that they’re walking on. A trip occurs when a person’s foot unexpectedly comes into contact with an object that’s in their path. And a fall occurs when a person’s balance is off. Obviously, a slip or a trip can cause a sudden loss of balance, but so can other behaviors such as leaning too far to one side when on a ladder. Adopt a “clean as you go” approach. Instead of waiting until the end of the day to pick up after yourself, put tools and equipment away as you finish with them, sweep up as needed, and place scrap and trash in the appropriate containers instead of letting debris accumulate around you. When you notice a slip or trip hazard in your work area, take care of it before anyone gets hurt: A file cabinet drawer that’s left open is an accident waiting to happen – keep drawers closed when not in use. Clean up spills immediately and, while the floor is drying, use a “Caution – Wet Floor” sign or a barricade to warn other workers that a slip hazard exists. Keep hallways and stairways free of clutter. Don’t store tools, cans, boxes or other items on the floor where they can be tripped over. Keep hoses and power cords out of walkways – if a cord must cross a walkway temporarily, use an approved cord cover to make it less of a tripping hazard. Same-level falls occur when a person falls onto the surface that they’re walking on and elevated falls occur when a person falls to a lower level. When walking, move at a safe pace – give yourself time to get to your destination without running. Eyes front: In a busy workplace it’s easy to get distracted, but staying focused will help you spot any slip and trip hazards in your pathway. Workplaces are constantly changing – don’t assume that a walkway that was free of obstacles ten minutes ago is still clear. Don’t carry any object that’s large enough to block your vision – instead, find a safer way of moving the object. When going up or down stairways, always use the handrail and take the steps one at a time. Avoid walking through areas that are poorly lit – if you must enter an area with insufficient lighting, use a flashlight or other supplemental light to see better, and move about with extra caution. Report unsafe conditions like missing or damaged handrails and burned out light lighting to your supervisor. Whenever possible avoid stepping onto icy sidewalks, newly mopped floors, or other slippery surfaces. If you must walk on a slippery surface, walk more slowly and shorten your stride to keep your center of gravity beneath you for better balance. Point your feet slightly outward as you walk to add stability. When you set your foot down, instead of touching the ground with your heel first, place your entire foot flat on the ground so that it’s less likely to slide out from under you. If possible, avoid carrying anything when walking across a slippery surface and keep your hands out of your pockets – when you allow your hands to move freely they can be used to help maintain your balance as you walk. Need your employees to know more about avoiding slips, trips, and falls? Summit has courses to help you meet all your workplace safety training requirements. Peruse the catalog by clicking the button below!